Millions of people use Airbnb when travelling but its popularity sometimes puts it at odds with locals. So, how do short-term holiday lets really affect a neighbourhood? In the decade since it was launched, online home rental platform Airbnb has amassed millions of rooms worldwide. While Airbnb opens up some neighbourhoods to more tourists, it has sometimes proved unpopular with existing residents. Some fear property owners are switching from long-term tenancies to short-term rentals, which can be more lucrative. In Manhattan's Lower East Side, for example, one study found that full-time Airbnb listings earned, on average, two to three times the median long-term rent. New York City has been subject to a recent bill requiring online rental services to hand over host data, with the hope of cracking down on commercial operators. The aim is "protecting our affordable housing stock for the millions of New Yorkers who could not live here without it", says New York City council member Carlina Rivera. And while Airbnb represents only a tiny percentage of all housing units in any given city, it can represent a very substantial percentage in certain neighbourhoods, such as in Barcelona's Old Town. A 2015 study indicated 9.6% of all homes there were listed on Airbnb - and in the Gothic Quarter section of the Old Town this proportion jumped to 16.8%. Barcelona has stopped issuing new tourism housing licences, without which short-term rents are illegal. Barcelona council says illegal accommodation "creates speculation and illicit economies and its activities leave nothing positive for local neighbours, causing nuisance and complaints". The Barcelona study and various others - including those looking at Boston, Los Angeles, and the entire US - have also suggested a link between the concentration of Airbnb properties in a neighbourhood and rising rents. The Los Angeles study indicated that, in 2014, almost half of Airbnb listings were clustered in seven neighbourhoods, where rents increased a third more quickly than the city average. The wider US study suggested a 10% increase in Airbnb listings led to a 0.42% increase in rents and a 0.76% increase in house prices. Of course, many factors affect housing markets. And the author of the Los Angeles report suggested the growth of Airbnb could be as much a result as a cause of wider affordability problems. But the report also suggests that Airbnb profits from illegal rentals that "cause rent increases, reduce the housing supply, and exacerbate segregation". Aside from affordability concerns, some worry that a rapid expansion of short-term lets can alter an area's atmosphere. Edinburgh's heritage watchdog fears "the character of the Old Town in particular is being changed" by short-term lets, although it acknowledges these rentals boost tourism and help businesses. Another study interviewed a small group of residents on the Hawaiian island of Oahu about their perceptions of short-term rentals. It identified both positive and negative effects - but more of the latter. People were most worried about the sense of community being damaged, with this referenced more than twice as frequently as property values and affordability. "This thing is changing the sense of place of the neighbourhood. It's changing the feel of it, with almost a revolving door of strangers," one resident said. Some also fear holiday lets add to problems of "over-tourism". Barcelona and Venice, for example, each receive more than 30 million visitors a year, leading to vigorous debate about the consequences. At other times, there have been complaints about short-term visitors' behaviour, including throwing loud parties or creating parking congestion. But Airbnb and other short-term lettings sites can offer positive experiences for both guests and hosts. Many guests hope to save money versus a hotel or to have more "authentic" holiday experiences in less touristy neighbourhoods. My research has found as many as 90% of Airbnb guests have said they were "satisfied" or "very satisfied" with their stays. Hosts get the chance to meet people from around the world, while earning extra money. As for the wider community, Airbnb can help accommodate more tourists and drive new customers to businesses in primarily residential areas. 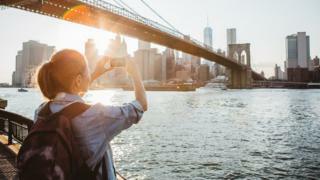 For its part, Airbnb argues that it helps to diversify tourism by promoting areas that need visitors the most and reducing overcrowding in tourist hotspots. It says the money gained from hosting on its platform delivers economic and social benefits for families, communities and governments. "While the travel and tourism industries continue to grow faster than most of the rest of the economy, it is critical that residents and communities are benefiting from often record numbers of visitors to their cities," an Airbnb representative said. The company added that it worked with governments around the world on clear rules "to ensure that hosts and guests can use the platform with confidence and certainty". The rapid expansion of short-term letting companies - as with drones and driverless cars - is a relatively unexpected phenomenon causing governments to rethink existing regulation. Airbnb aims to host one billion guests each year by 2028. The scale of its ambition means regulatory battles are likely to continue for the foreseeable future, as more places try to shape and control its impact. We may see more of the strict crackdowns that have happened in places such as Japan, Barcelona and Palma. Even jurisdictions choosing a more conciliatory approach may still restrict certain types of listings and require some data sharing on rental activity. This may put the brakes on the company's growth target but it could also help formalise and legitimise the presence of Airbnb as a permanent fixture in neighbourhoods around the world. Daniel Guttentag is an assistant professor in hospitality and tourism management at the College of Charleston, South Carolina. He is also the director of the department's Office of Tourism Analysis.